We've had a reprieve from the early season challenges, and this week we've has been filled with good news. The kohaku we've been growing on were spawned mid May last year; the spawning and by way of brief reminder on how things went last year --> rearing to 1 inch went well, and we had a bumper harvest. The summer growing period was more challenging and you may remember they were around 10cm down on growth by October, compared to my efforts on previous years. They’ve been growing really well since then and I measured a few up during this week and many are into the 30’s cm. I picked out one of the largest ones, which measured in at 37cm. So, since October/November, they’ve been motoring along at the same growth rate that I’d expect to achieve with that particular spawning set – roughly 0.75cm to 1cm per week on average until the fish reaches the early to mid 40’s cm. After last year's South Of England show, Ralph Pegden approached me with the idea of using my home bred kohaku for his club's grow and show event the following year. At that stage, I'd only just spawned my trusty kohaku parent set and it was very early days in my breeding process. And from Ralph's side, he needed to take the idea through the club's committee. 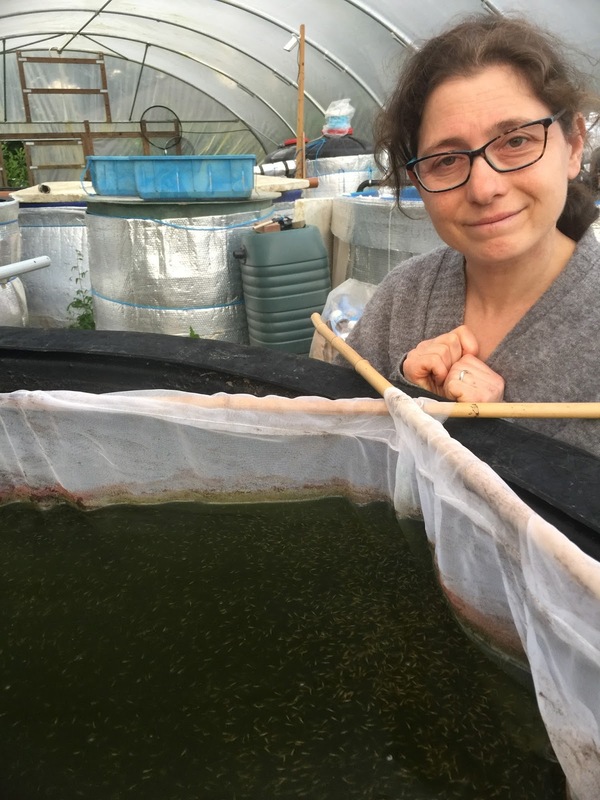 We agreed to review it later in the year, and around January time (2016), I reviewed how the tosai were getting on; we shared some pics of video of the koi that we could provide for the grow and show event, and agreed with the club to put them aside for their event. I feel very privileged to be asked, and for the club to have confidence in my breeding efforts to base their grow and show event on my home bred kohaku's. For me, it's a really big deal. Making the commitment meant I had to get the growing on right over the winter; not just for my own purposes, now it was for a club's grow and show event too! I needed to bring my tosai up to a good size for them and also to have enough at the right standard to be able to provide the club with a good selection for their event. Several months later, and with the koi thankfully having grown really well, we arranged for the club to send a team to our place yesterday (Saturday) to collect the club's koi. Amanda and I planned to go through the tosai tank on Friday night (the night before the guys were due to arrive) to prepare a selection for the event. Coming back from work that night, I was held up in what was described on the radio as a 55 mile hold up on the M25 (motorway).. so by the time I got home we had just an hour of daylight to start the process. Richard, Trevor and Malcolm arrived and we all dived into a some bacon sarnies (classic koi club food!) 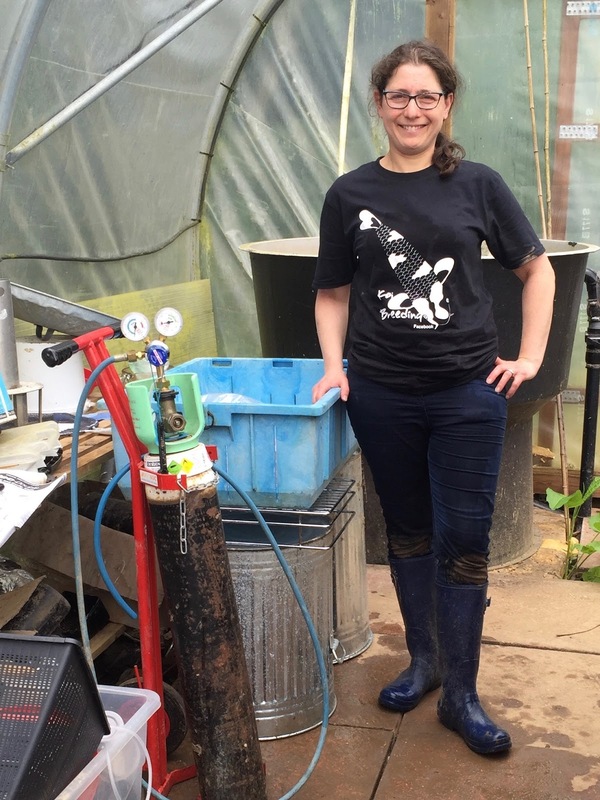 before getting on with the task of packaging up the grow and show koi. 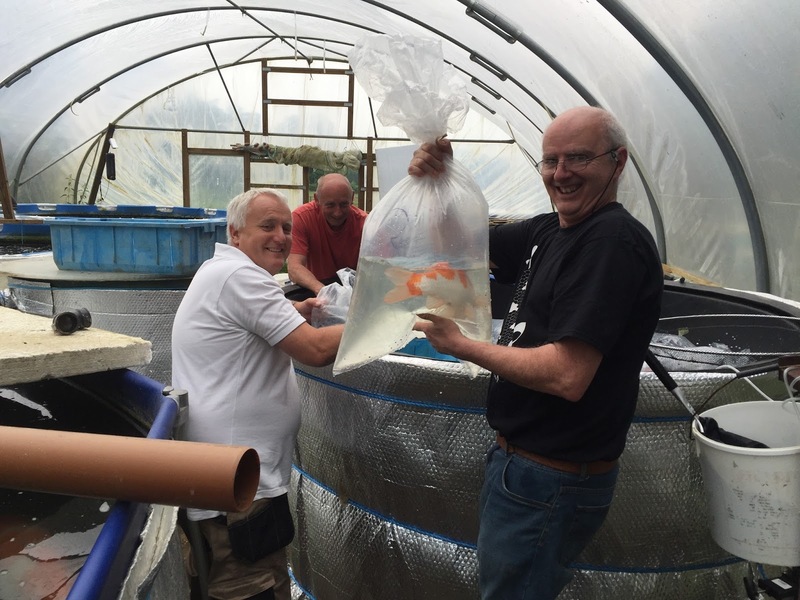 The guys lent a hand, and together with Amanda and I, we formed a processing line in the polytunnel with Richard and Malcolm selecting the koi, catching and measuring; Richard moved the koi into an inspection bowl where I'd photograph it (for my records), and then Amanda bagged it and passed the bag to Trevor who added the O2, tied the bag and then Amanda and Trevor took it in turns to carry the bags out to the plastic crates the team had brought with them for transporting the koi. Richard Nice came with some gifts for Amanda and I; a T-Shirt with the logo of his new Facebook Koi Breeding group page. Here's Amanda at the bagging up station sporting the new T-Shirt. Thanks Richard! I was pleased with the size of the koi, with 12 being 35cm or larger, and the average was 32.4cm. We got through the whole lot in just 2.5 hours, and then tucked in to the Dorset Apple cake that Amanda cooked for us the night before. The cake lasted all of about 5 minutes :-) before it was demolished by the guys, with the kids piling in for the last bits. All in all, a great morning with the guys and from our side, the satisfaction that we've delivered a good batch of fish for their event. It's going to be interesting to hear how the fish get on over the next 12 months in the member's ponds. Space is running out fast, and the fry look cramped in their cage nets within the black rearing vats. 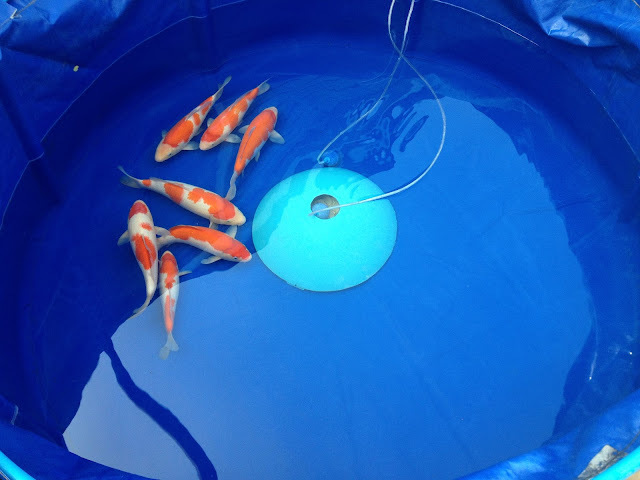 So, our attention turns to empting the growing on ponds of nissai and tosai, to create space for the new fry. We have plenty of room and filter capacity in that system to grow on all the fry if necessary. Moving on the grow and show fish has helped empty the system, and, I’ll probably leave the rest in place until the South of England show weekend, less than a week away now – then some fish will hopefully go to the show, and I’ll move the others into the males tank system. My kohaku Grow and Show is happy feeding away in the pond and is a welcome addition. I look forward to seeing how it develops and grows, 36cm measured but it is bigger than that, must have grown in the bag! I will be interested to hear how this years koi are growing under a different feeding technique? 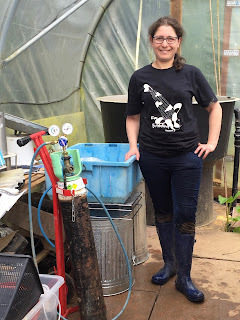 Great Blog, your an inspiration to us koi keepers.